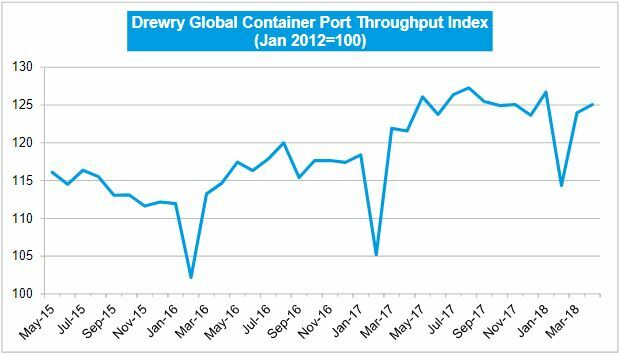 • In April 2018, the global container port throughput index witnessed only one point increase to 125 compared to March 2018. However, the index is more than three points higher than the April 2017 level of 122 points. Overall though, activity in the first quarter was relatively quiet. • The largest monthly increase was for the leading region China where the index increased by 4% (five points) to 135 in April 2018. The largest decline was in Asia (excluding China) where the index was 4% (five points) down compared to March 2018. • The April 2018 index figure for all other regions decreased except North America and Africa on month-on-month basis. Both witnessed 1.5% monthly increase when compared to March 2018. • The annual increase for both these regions was close to 5%. However, the index for Africa is based on a relatively small sample. • Latin America witnessed 1.6 % monthly and around 1.3% yearly decline in throughput index for April 2018. Europe also showed more than 1% decline (1.4 points) however it was four points up compared to April 2017.